Pal-Ul-Don is a Lost World from Tarzan the Terrible a novel by Edgar Rice Burroughs. This scene is not from the book, but loosely inspired by it. My pictures are inspired by what I read, the movies I see, comics, conversations I have with other people, and of course my own experiences. Technically, a picture like this is much easier to create than you think. I am a photographer (well, when I am not a systems thinker that help organizations improve their processes and their organizations). When I create a picture like this, I think like a photographer, and to a large extent, work like a photographer. For example, you may have noticed that this picture has a slightly different aspect ratio from what you are used to. That is because it is 1.85:1, which happens to be the aspect ratio Steven Spielberg chose for Jurassic Park. Why did he do that? 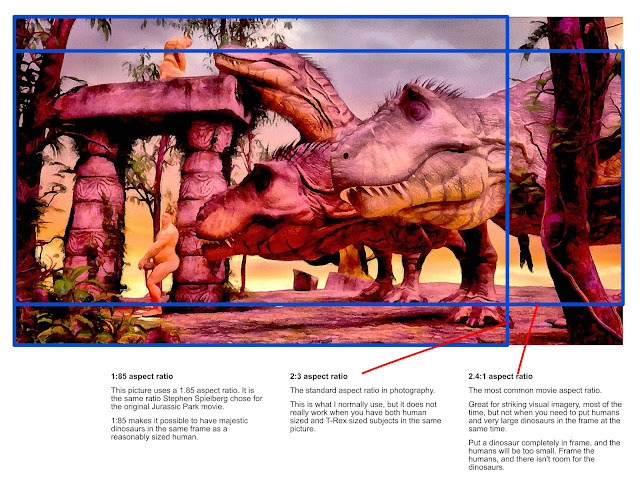 Movies are usually shot in a 2.4:1 aspect ratio, making the pictures very wide. his is great for a lot of things, but it gets cramped for a dinosaur that is very high. 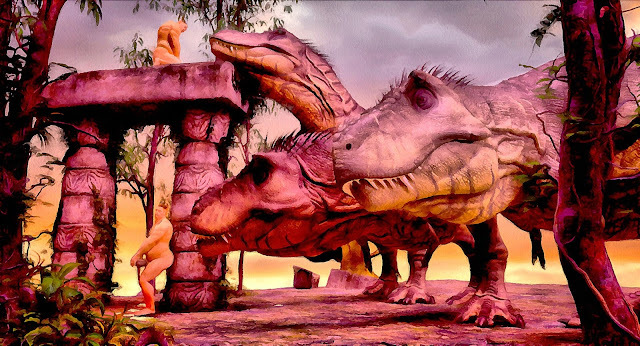 The picture above compares the 1:85 aspect ratio Stephen Spielberg chose for Jurassic Park with the 2:3 ratio common in photography, and the 2.4:1 ratio of most movies. If you want a T-Rex to look good, go with 1:85! ...except, of course, when something else works better. The Jurassic Park movies have been shot in a variety of different aspect ratios. 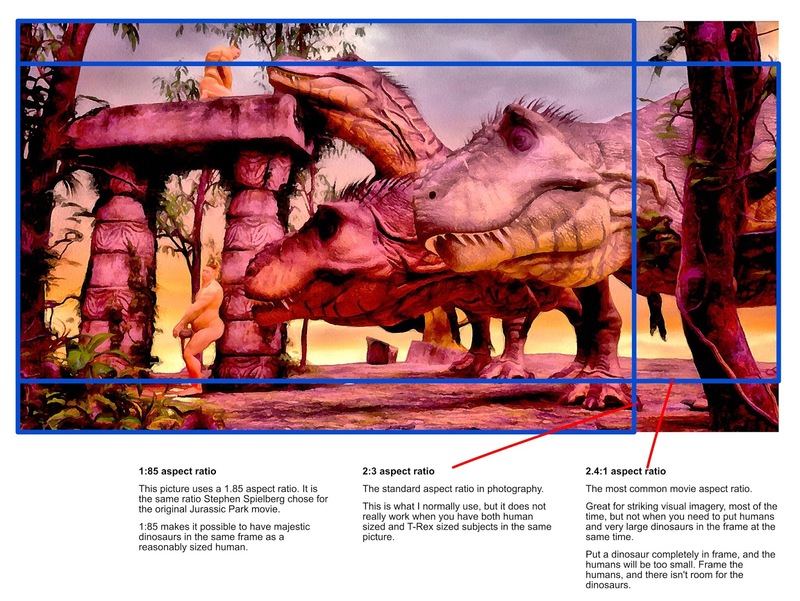 Jurassic World was shot in a non-standard aspect ratio, 2:1. If you are working in 3D, don't forget that you may need to adjust the focal length of your camera to get good results. Daz Studio uses 65mm lenses by default. For An Afternoon in Pal-Ul-Don I used a 50mm lens. Jurassic World used mostly 30mm and 60mm. A bit of trial and error works wonders here. I decided what I wanted in frame first, then set the aspect ratio, and adjusted focal length and camera position until I was happy. If you value likes on Facebook more than you value creating a good picture, you might want to use the photography portrait aspect ratio, 3:2. Because Facebook uses a narrow column for posts, using portrait format maximizes screen space. To really see and experience the impact of a landscape format picture on Facebook, it is necessary to enlarge it by clicking on on it. Most people won't do that, even if you have created a great picture. Instead, to maximize likes, you will either have to butcher your image and crop it down to portrait format, or design your picture for portrait format from the start. With 3D, you can create a set of cameras using different aspect ratios, and use them to create different versions of the same scene. Me, I am bull-headed and tend to go with the aspect ratio I like best on a picture by picture basis, even if it means the pictures won't get as popular on Facebook.